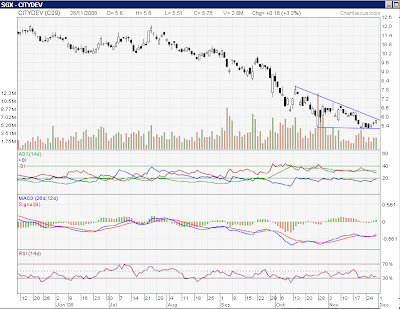 City development is testing the upper boundary of its down trend channel. MACD just made a bullish crossover and it indicating further strength. ADX is decreasing which is a good sign. This means that the down trend that we have seen in the past few months is decreasing in strength. 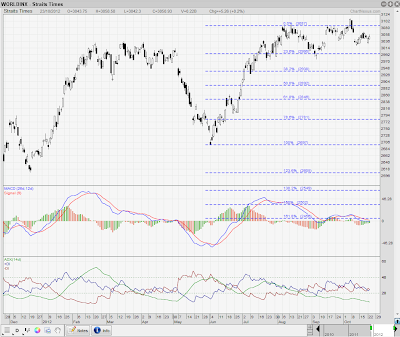 However the +DI is till below –DI suggesting that the current rally is most likely to be a bear market rally. The +DI will need to get above the –DI for a confirmation of bullish market. Short term resistance is at $6.34 and $6.97 levels. All bets are off if the price drops below $5.15.